This sensitive and searching debut confronts the conflicts of a newly ordained young priest from a family whose men "have always loved strong drink and a good fight," torn between his desire for spirituality and the temptations of the flesh. —Publishers Weekly "Best Books of 2010"
"In this potent debut about a wayward yet devout young priest who struggles to reconcile his faith with longings of the flesh, Reimringer has crafted a suspenseful, illuminating, and highly readable saga." "This book knows the soul of the great old city: the yellowing taverns and fraying neighborhoods, the sense of grace in decline, the doubtful saints wrangling their disbelief. John Reimringer writes with the confidence and observation of one who was there at the time and is there still, and his novel has the knuckles and shouting and beer breath of glory." "In this memorable, skillful novel, Reimringer writes compassionately about the tie between violence and yearning, the calls of the body and the calls of the spirit. Many writers can write well about one or the other. The gift of this writer is his rich understanding and love of both. Vestments is a wise, wide, and eloquent book." "Vestments makes a powerful claim for the passion and danger to be found in the love of the spirit as well as in the desires of the body. Deeply rooted in history, burning with family furies, and told by a narrator-priest you find yourself rooting for (and wondering about), this is a captivating novel." "Ribald and wry, concerned at heart with faith and forgiveness, Vestments is a rich, involving debut." 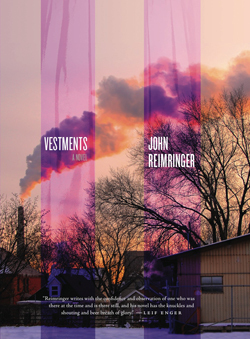 All Rights Reserved © 2010 Vestments by John Reimringer. Author photos courtesy of James Peters and Katrina Vandenberg.